I shop and review a lot of sites, but Persunmall is hands down one of my very favorites. They’re selection is truly gorgeous, high quality, and fashion forward! I love that I can flip through pages and pages of their products and want almost everything they sell! Lately I’ve seriously wanted to buy almost everything on their site, and I’m usually very picky! I love that Persunmall prides themselves on providing truly innovative fashion that you will not find anywhere else! Their pieces are truly unique, and completely statement making! Being a fashionista, most of us want our style to stand out, and our clothes to be different from what the crowd is wearing, right? Persunmall can easily help you do just that! Their fashion is truly fashion-forward, and you will be starting trends by shopping here! One thing I have to mention about Persunmall that I absolutely adore, is that you know exactly what you’re getting. Being a vegetarian, I am very concerned about cruelty towards animals. While I’m a big animal lover, I also love my fashion, and am guilty of buying a few leather pieces. But what you may not know is that a lot of fashion you buy from other countries, especially from asia, is not what you think it is, when it comes to leather. There is a reason you can buy cheap leather for only $30 and that is oftentimes because it comes from small animals, that most of us love, and have in our home. I know, I know, sorry to be a buzz kill, but its true, and something we should all be aware of. That is why I love persunmall, their leather is high quality, and they list under products exactly what kind of leather it is, whether its cowhide, goat skin, pigskin, or sheepskin, so you know exactly what you’re getting. And if you would rather buy Vegan like me, Persunmall offers a fabulous selection of PU leather (Vegan leather) boots and bags, that are still high quality, more inexpensive than actual leather, and is cruelty free! I recently got to try out some beautiful fashion from Persunmall! Here I’m wearing the Stand Collar Rose Print coat with waistband and red belt ($64) and Vintage Hollow Out Golden Short Necklace ($11). I absolutely adored these pieces! I love that the coat is so eye-catching, and although I’m not normally huge on prints, I found this printed coat to be a breath of fresh air! It is light and airy, and gives winter more of a bright cheerful spring feeling! The coat is lightweight enough it can be worn for many seasons of the year! I love that it can really dress up a going out look too, but is still the perfect way to make jeans and a t-shirt outfit pop too! Put this jacket on over anything, and you’re outfit is already put together, eye-catching and sure to make a great statement! I also absolutely adore this gold vintage necklace. 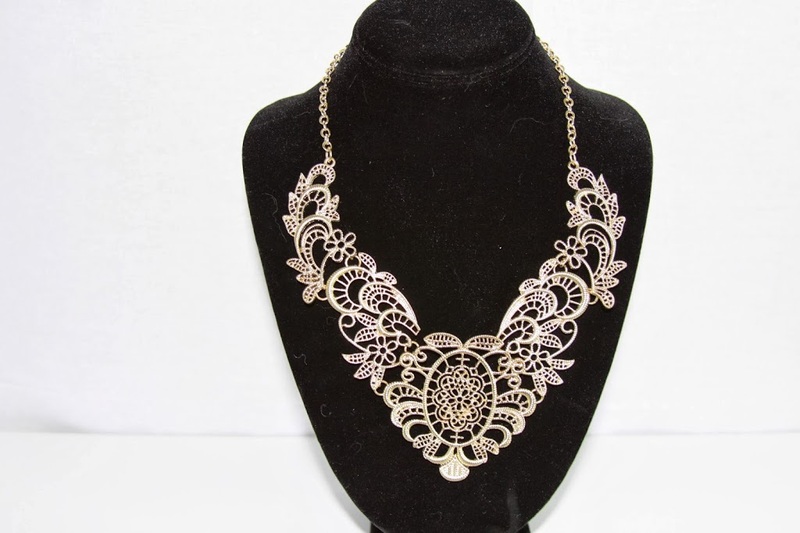 It is fun and playful, and the perfect statement necklace! 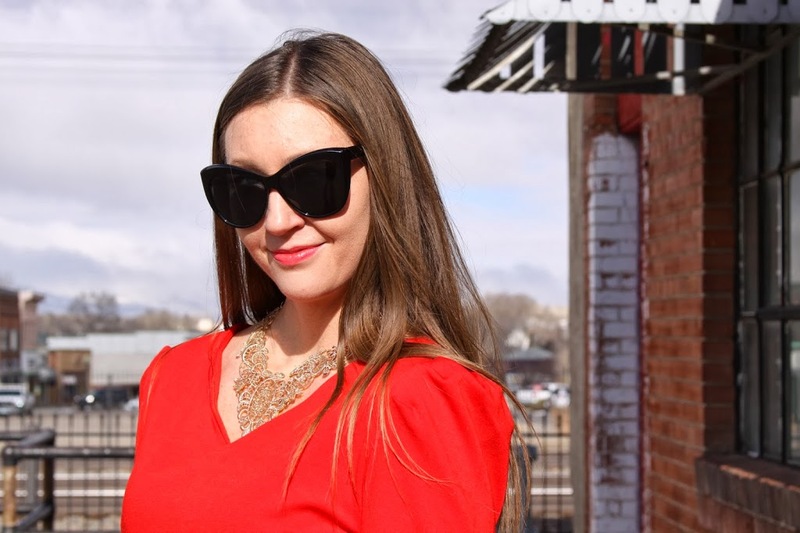 I loved wearing it with my red dress here, but find that it is the perfect way to dress up a casual weekend look too! The necklace is completely versatile! Be sure to check out Persunmall.com today, and find your own fabulously on-trend, pieces! **I was given these products for the purpose of review. However, all thoughts and opinions expressed in this post are solely my own. I only share reviews with my readers, I feel will be beneficial or informative to them in some way.